3 year old Juan Quiej's and 6 year old Kyneicha Pagan death by Dr. Patrick Bamgboye, DDS - Both children Papoosed! NEWARK — An Irvington dentist who was disciplined by the state after a 6-year-old girl died during a routine procedure eight years ago is again under investigation following the death of a second child in his care last week. Patrick Bamgboye, 64, was still on probation for the earlier incident when 3-year-old Juan Quiej and his mother arrived at Dental Health Associates last Wednesday. Juan, who was there to have cavities fixed, was restrained in a cocoon-like papoose to limit his movement and administered a local anesthetic, his mother said. Shortly afterward, the boy went limp, his lips turning blue. He had stopped breathing. He was later pronounced dead at a local hospital. The death has sparked an investigation by the state Division of Consumer Affairs, the agency that oversees the Board of Dentistry, officials confirmed Tuesday. "We need to know what happened and why," said Thomas Calcagni, the division’s director. In addition, Acting Essex County Prosecutor Carolyn Murray said in a statement her office was working with the Attorney General’s Office to determine if a criminal probe should be launched. "I feel sad. 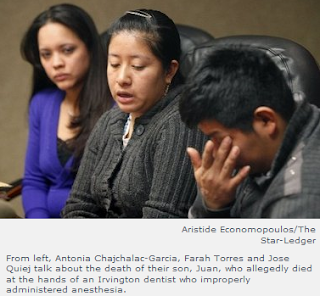 I feel defeated," Antonia Chajchalac-Garcia, Juan’s mother, said through an interpreter. "I keep thinking: Why did I take him? Why did I have to take him?" The boy’s death has brought fresh grief to the family of Kyneicha Pagan, who died under Bamgboye’s care in 2004, when he worked out of an office in Perth Amboy. "When I heard her story, it was the same exact thing," said Farah Torres, Kyneicha’s mother. "I feel like I’m having a nightmare all over again. "It can happen once, but not twice," she said. "Two innocent kids die. It can’t be a coincidence." Joseph Ginarte, an attorney for both families, said his clients want Bamgboye’s dental license revoked. "It’s a damned shame this was allowed to happen," Ginarte said. Bamgboye could not be reached for comment. A security guard at his Irvington office said the dentist had taken a personal leave. A lawyer for Dental Health Associates — a large company with dental offices across the state, mostly in urban areas — said Bamgboye was cooperating with the investigation and cautioned against a rush to judgment. "It’s way, way too early to assert blame," said the attorney, Harry Levin. "You had two kids who were in completely different medical circumstances. We’re not really sure what the child passed from yet." He said last week’s procedure was in no way unusual until it was nearly complete, when it was discovered Juan had stopped breathing. Calling the boy’s death tragic, Levin said every effort was made to revive him. And in the face of a "horrific circumstance," he said the lawyer for the families was "trying to stir things up a bit." According to the practice’s website, Bamgboye received his doctorate from New York University’s College of Dentistry in 1998. He had no serious blemishes on his record until the 2004 death of Kyneicha, who suffered from several serious medical conditions, including cerebral palsy. Like Juan, she was placed in a papoose and given a local anesthetic. And like Juan, she stopped breathing during the procedure, the Board of Dentistry found. Because of Kyneicha’s myriad conditions, a medical examiner determined the girl died of natural causes. But the board continued to investigate and, in 2008, filed a complaint against the dentist. Two years later, an administrative law judge found no gross negligence. Still convinced of some level of wrongdoing, the board suspended Bamgboye for three months in January of last year and placed him on probation for an additional 21 months. The board wrote in its order that Bamgboye should have done more to learn about the girl’s conditions before performing a dental procedure on her. "It is the very lack of comprehensive assessment that led him to the faulty — and tragic — conclusion," board members wrote. Bamgboye is quoted in the order as well. "An unfortunate single incident should not define one’s career," he said. For both sets of parents, questions and grief remain. "I am devastated," said Juan’s father, Jose Quiej. "He was my dream, my future, the light of my life."